Folkston, GA--The threat of an impending hurricane led the Fellow Travelers the 2005 September trip scheduled for the St. Mary’s River. The hurricane never materialized, but neither did the 2005 September trip. The group decided to do the trip one year later. There was little interest in the trip, but five did agree to try the paddle, although Art Shelfer and George Royal elected to join late the first day rather than complete the entire paddle. Ed Skorupski agreed to do the shuttle and indeed has his friend, Mandy, ready to do it, but Russell Barber of Trader’s Hill Park actually did the driving. Wednesday, September 6, 2006, Charlie got a room at Folkston’s Western Motel, ate a good roast beef supper at the Family Restaurant next door, and settled in. Roy Moye called and asked if he could share the room. so the two were ready for the trip on Wednesday. After a hearty breakfast at the same cafe, they loaded Roy’s Solo 14 onto the trailer and awaited Greg Baker. Greg ca me, and his Magic was also affixed. Then there was the short drive to Trader’s Hill. Ed Skorupski and Mandy did show up to shuttle, but the park manager, Russell Barber ( a descendant of famed swamper Obadiah Barber) agreed to drive the Suburban Profane and trailer to the put-in at Stokes Bridge and return it to the park so it would be ready at take-out time on Saturday. Stokes Bridge is not the ideal put-in site, and that is stating it mildly. It is a one-lane concrete bridge on a rutted road with hardly any shoulder. There is no parking place, and it takes someone skilled as Russell Barber to turn a trailer. Nevertheless, the canoes were carried down the steep narrow trail and the gear was loaded. All three paddlers were soloing. The St. Mary’s is little more than a creek and does not really open up until the Thompkins Landing, which was reached on Saturday. However, it is a pretty creek. The depth of the water seldom reached two feet, and the course was twisting. Speed canoeing was not the name of the game, but there was enough water that most of the shallow places could be floated without getting out of the canoe. There were potential campsites around almost every bend, and there were lots of bends. Although no alligators, raccoons, deer, or bear were seen, there was a terrific variety of birds. The group saw ducks, osprey, hawks, wild turkey, varieties of herons including green herons and Louisiana herons, limpkins, and songbirds too numerous to mention. The first turtle was not seen until the third day. No one was seen at all on the first day, and only a couple of people were seen the second. There was no landings between Stokes Bridge and the St. George Bridge, and no power lines crossed the river. But there were hundreds of logs in the river. Some could be floated over, others floated under. Roy seemed to have an uncanny ability to find logs, but the fact that his canoe was two feet shorter than the solos paddled by Greg and Charlie gave him a real ability to n egotiate. It began raining within a few minutes of the launch. It was a soft drizzle, but what it lacked in intensity it made up for in duration. It was almost 5:00 PM before the rains finally stopped. No one manned rain gear, and everyone was reasonably damp, but probably no damper than had the paddle been done on a hot, humid, and sweaty day. The three took lots of breaks. Gourmet lunch of Vienna sausages, cracker, sardines, grapes, and candy bars was eaten about 1:00 o’clock. The GPS indicated that progress toward the St. George Bridge was not speedy. The canoe guides disagree as to the distances on each section of the river. The optimistic one said it was 12 miles from Stokes Bridge to the St. George Bridge, and the pessimistic one said it was 14.5 miles. Greg, Roy, and Charlie began to think the pessimistic one was optimistic. The GPS distance was 9.68 miles, but the river did wind. The river continued to be shallow, winding, obstructed, and often canopied. In one particularly crooked obstructed channel Greg’s Duluth pack caught on an overhanging branch and swamped the Magic. It was good-bye to the cornbread, Lillian’s specialty brownies, and Greg’s cell phone. After emptying the canoe and repacking, the trip resumed.. Eventually the St. George Bridge traffic could be heard. Just upriver (south, by the way) of the bridge is a railroad trestle which also required some tough paddling to get through. Art and George had been instructed to meet the others about an hour past the St. George Bridge so that a suitable campsite could be found. Charlie had told Art that the three would expect to pass under the bridge between 2:00 and 3:00 o’clock. Actually, Greg, Charlie, and Roy made it to the bridge at 4:45 PM and Art’s truck was already there. Trying to make contact by cell phone was not working. So Art and George thought they were behind but they were really ahead. Just beyond the bridge the river splits. Greg, Roy, and Charlie took the right which was really the wrong. (They later found that Art and George had done the same!) After a short d etour and observing wild turkeys and limpkins, the three paddled back and took the left run. It was still impossible to contact Art and George by cell phone, so the journey continued. Finally, Charlie’s phone rang and it was Art. A few minutes later the two were paddling upstream and met the others. Shortly beyond that there was another decision as to which way the river ran. Everyone except George wanted to go to the left because the water looked bigger, but George prevailed and right was right. It was time to find a campsite, and that still was not a difficult task. The tents and the outfitter wing were pitched. Charlie cooked his own supper which was ground beef and vegetable wrapped in tinfoil. Art cooked a pot roast, but it was not ready to eat until way past dark and reasonable bed times. Nevertheless, those eating said it was good. Friday’s breakfast was a combination of individual meals and some community sharing. The King made a large pot of coffee and there was none left. Eventually the tents were taken down, the canoes packed, and the trek begun by about 9:30 AM. The character of the river had not changed a lot. It was still winding, shallow, and obstructed. The next GPS was Thompkins Landing, which the pessimistic guide said was 21 miles and the optimistic one said was 17 miles. It was decided to stop before reaching the landing regardless of what time. The group was hoping for an early afternoon campsite. The GPS distance was a little over eight miles. The second day saw no rain, but it was relatively cool for September. The birds continued to entertain. There was still almost no development, but many of the sandbars were decorated with plastic chairs. Art and George took a liking to one and tied it atop the back of their canoe. It look like a disaster waiting to happen, but even though it did get knocked off a couple of times by overhangs, it did not cause an upset or swamping. There was one disaster--Charlie was helping push a canoe over a shallow spot and his digital camera fell out of the life vest pocket into the water. It is in the repair facility and prayers are being said that the injuries are not terminal. There was never any road access to the river even on the second day, but there were the remnants of an ancient bridge at a place designated as Toledo. There were a couple of fishermen seen. The trip was routine, and the group did not hesitate breaks. The paddling continued until almost 6:00 PM, and then a terrific campsite was found. It did have access by a rough road, but that was compensated for by a picnic table at the edge of the woods and a lot of firewood. Greg prepared jambalaya for supper, and it was ready to eat in just a few minutes, long before dark or bedtime. There were other shared goodies such as grapes and gingerbread cookies, but there was neither brownies nor cornbread. The five men sat under the outfitter wing or by the campfire until almost midnight. It was full moon night, cool, and almost mosquito free. Breakfast on Saturday was pretty much individual meals, but there was some sharing. After breaking camp the men got into the canoes and headed for Thompkins Landing, which the GPS said was about a mile and a half away. It did not take terribly long to arrive, even though the paddlers took a good break before getting there. 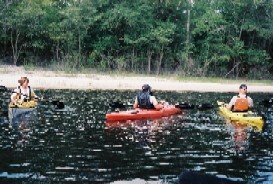 Upon arrival, the group got to wat ch a kayak gang put in. The group included Buddy and Elizabeth King who were friends of John and Karen Chauncey. The pessimistic guide it was 8.5 miles to T r a d er ’s H ill, t h e o p ti m is ti c g ui d e s ai d it w a s 7 m il es, a n d t h e G P S s ai d e x a ct ly 5 m il es. A ft er T h o m p ki n s L a n ding the river was no longer obstructed, and in fact became rather deep and wide. There were several houses and other signs of development, and several motorboats were encountered. The kayakers left Thompkins Landing before the travelers, but the amazing skill of the group soon passed the kayaks and left them in the mist. The kayaks almost caught up with the gang at the lunch break, but the five again set out ahead. It was about 3:00 PM when the landing at Trader’s Hill was reached. After the canoes were loaded on to the vehicles the kayakers began arriving. Greg and Roy went their separate ways to distinct parts of Florida. Charlie took Art and George along with their canoe and gear to the St. George Bridge, stopping for a popsicle on the way. (Actually, it was a Push-Up as there were no two-stick popsicles available. After loading the gear and canoe onto Art’s truck, the two-vehicle drove through Moniac, Statenville, and Valdosta and then headed for the separate destinations. It was a fun trip, but a tiring one. The Fellow Travelers would not recommend putting in at Stokes Bridge, and would think a good three-day trip could begin at the St. George Bridge and end at Trader’s Hill. In 1992 the Fellow Travelers canoed 57 miles (by the optimistic guide0 on the ST. Mary’s and did it in three days, but it was too long a trip then and is especially so now as a few of the travelers are getting senior citizen discounts. A special thanks to Ed Skorupski, Mandy, and Russell Barber for the shuttle service.